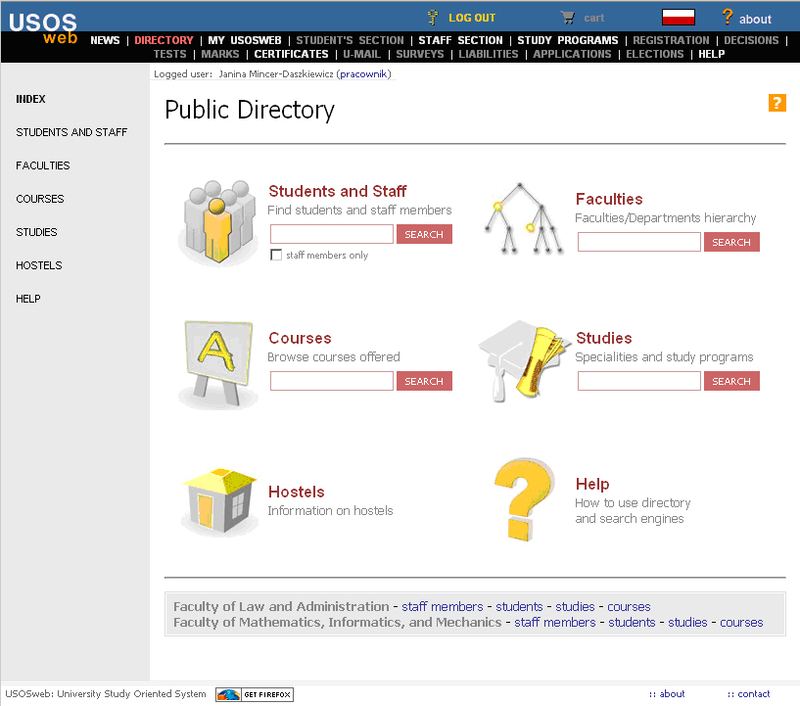 University Study-Oriented System (called USOS) is a student management information system used in 50 Polish universities, technical universities, higher vocational institutions, university schools of physical education and other types of high education institutions. Among these schools are top public universities in Poland, like the University of Warsaw, Jagiellonian University from Kraków, Adam Mickiewicz University from Poznań, and Nicolaus Copernicus University from Toruń. From the functional point of view USOS is probably a typical software information system supporting management of higher education at university level. What makes it unique is the, unification of services at country level and integration achieved from effective cooperation of universities who jointly develop and deploy the system on a scale hardly to be found not only in Poland, but also other European countries. It is the only system of that kind in Poland, being built by universities for universities, with a business model acceptable to even the smallest institutions. This cooperation creates new quality in administration of education, since existing processes, rules and documents are discussed, changed, unified, before getting computer system support. System development is driven by user needs reported daily to system developers. Lobby of universities can influence existing law, as some examples demonstrate. Such cooperation has an impact not only on administration of education, but on education itself, mainly by supporting transparency and comparability. These aspects can be regarded as good practices to notice and disseminate. Building and deploying university information system is a life time project, which never ends. New needs arise every day, law changes, priorities are reevaluated, development of information technologies creates new possibilities. The project of that kind should always be regarded as work in progress. The beginning of USOS dates back to 1999-2001, the days of the New Educational Tools Tempus JEP project, which involved 17 Polish public universities. The project objective was to design and introduce an integrated software system for academic administration, students, and faculty. In two years fully functional software was produced and deployed in some of the faculties of the participating universities. The functionality of USOS at that time was limited to course catalog, course registration, class schedules, student and teacher personal data, study programs and requirements of degree certificates, but anyway the system with central university Oracle database and remote access for all people involved in a didactic process was a great jump comparing with local desktop applications available at universities at that time (if any at all). negotiating with companies selling IT software and hardware. Consortium is an open organization in a sense that can be joined by any high education institution. USOS had a good start-up thanks to European money of Tempus JEP. Universities which established MUCI developed a new business model. The cost of system maintenance and development is covered from the fees of the member institutions based on the project budget. Every new institution pays some initial share and then an annual fee which depends on its size. Fees are low, within budget of even very small organizations. Consortium may also apply for external funds from prospective sponsors in addition to routine annual operating budgets. MUCI is a non-profit organization, meaning that whatever money are gathered are in total spend on system development. This business model is acceptable for small organizations which pay low annual fee and get in return fully operational, mature information system, with all its subsystems and modules. License does not limit a number of end-users or installations. Source code is available on demand. Some institutions participate in development by preparing locally additional reports or functionalities and sharing it with others – these changes after approval get incorporated into an official distribution of USOS. Each participating institution is represented in the MUCI Council by rector's plenipotentiary responsible for IT or other authorized person. Each institution has the same voting strength. The Council is responsible for acceptance of the annual report of the board, acceptance of the fiscal balance, election of the board and its chairman, acceptance of new members of the consortium, approval of the budget for the next fiscal year. A Board of Directors consists of 5-11 members. Chairman of the Board of Directors is the chief executive officer of the consortium. The Board is responsible for deciding on the overall direction of activities, budget proposals, production of the annual report and fiscal balance, signing agreements with other companies, supervising Project Commissions etc. A group of UCI members may launch a common project. Projects are supervised by Project Commissions consisting of representatives of the institutions belonging to the group. The Project Commission decides about the project budget, hires a Working Team which is responsible for carrying the project, appoints a project leader, sets task and priorities for the team. USOS is one of such projects (the main one at the moment). The USOS Working Team has been located at the Faculty of Mathematics, Computer Science and Mechanics of the University of Warsaw, which is the home for USOS from the beginning. The USOS Commission meets once every few months and functions as a forum for information exchange between the users and the USOS Working Team. It is responsible for stating and ranking maintenance duties for the team. Many mail discussion groups exist for people from cooperating universities involved in system deployment and development for daily contact. The USOS Working Team coordinates all design and programming work in accordance with the directives of the USOS Commission, debugs the system, issues new USOS distributions, takes responsibility for development and maintenance of interfaces to other systems, supports help-desk, prepares system documentation and manuals, assists new members with converting data from old databases to USOS database, suggests tasks and ideas for further development, informs other parties about USOS. Locating development team in university environment has its advantages and disadvantages. As in most countries, salaries at universities can not compete with the ones offered by industry or software companies. On the other hand such environment guarantees the highest level of expertise on ‘business logic’, i.e. study programs and procedures involved in university management, and daily contact with end-users. In the beginning students and faculty staff were the main task force of the team, but this model changes. More and more projects are run by programmers hired and paid by MUCI. They usually are employees of partner universities of MUCI. USOS started as a central Oracle database with an interface for university administration for handling main aspects of university education, like course catalog, course registration, class schedules, students and teachers personal data, study programs and requirements of degree certificates. Steadily new functionalities were added and now USOS is present in almost every area of university administration. Only projects which can be regarded as milestones are listed below. 6.1. Very early it became necessary to add a subsystem for handling financial aid for students on the one hand, and student tuitions supported by speed collect, on the other hand. 6.2. Quality is achieved – among others – by transparency. The data stored in university database can be viewed by students through web based systems. Using USOSweb (see fig. 1 and 2) they can browse information about their study progress and grades, register for courses and particular classes, be informed by lecturers about important events through built-in messaging system, assess courses by an integrated course assessment system etc. Another web-based system supports university-wide so-called token registrations. Yet another implements electronic archive of diploma theses. These applications are oriented towards massive numbers of clients accessing them via web browsers and are made in open-source technology. 6.3. Poland signed the Bologna Declaration in 1999 and joined European Union on May 1st, 2004. It was necessary to make USOS fully compliant with requirements of the Declaration. USOS supports ECTS credit system and diploma supplements. All web based applications are available in English. An ECTS catalog (fig. 3) is available on-line for foreign students. 6.4. Due to growing popularity of on-line courses USOS was integrated with an e-learning platform based on Moodle. Students register for these courses in a token registration system. Results of language placement tests are transferred from Moodle to a token-registration system via USOS and decide about the possibility to register for language classes. 6.5. 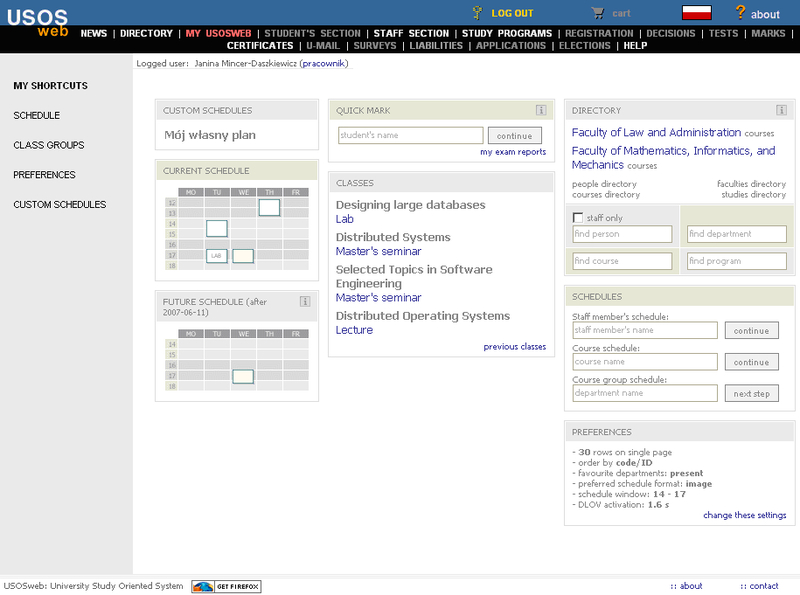 Web-based central admission system (IRK) had been in use at the University of Warsaw since 2002. In 2005 the system was offered to MUCI and became a part of USOS distribution. IRK is also available in English. 6.6. Year 2006 was the first year of electronic students identity cards on Polish universities. The whole software and hardware infrastructure had to be built from scratch, but now the system supports electronic cards, printers, readers, and digital signatures from various vendors. In some of of the cities electronic student identity cards can be used in public transport system as valid ticket holders. For use in libraries a card had been equipped with a contactless-chip and a bar code on the reverse. Photos were gathered via IRK and transferred to USOS (fig. 4). 6.7. Since Poland joined the European Union, the number of foreign students coming for short-term visits grows rapidly, as well as the number of Polish students going abroad. Support for handling student mobility inside Europe has been added to the system. 6.8. Since the number of web-based applications which together constitute virtual university grows steadily, it became necessary to implement user-friendly authorization and authentication system. We started in 2005 by building the central repository of accounts and profiles for users of web-based university applications. The system called CUS gathers accounts of all students and staff and verifies on demand passwords delivered to it by applications (also mail servers). In 2007 we added CAS on top of CUS. CAS is an open source authentication server supporting single sign-on. All USOS web-based applications were adapted for use with CAS. Now CAS is offered to member universities preinstalled on a virtual platform with Tomcat and application for changing passwords. 6.9. Data and statistics are necessary for efficient management at every institution. First pilot Statistics module based on OLAP engine was built (fig. 5). 6.10. SRS developed in 2010 is a system for booking classrooms for classes and other events. 6.11. USOS API (available at https://apps.usos.edu.pl/developers/api/) is a simple REST protocol, which allows developers to access data gathered in academic database run by USOS. It uses uses OAuth protocol for authorization. USOS and its subsystems are installed locally at each university, member of MUCI. Cooperation on USOS development gave impulse for cooperation in other fields. In 2006 the University of Warsaw came up with an initiative to build Country Registry of Maturity Examinations (KReM). Due to some legal aspects such registry could neither be offered by Central Examination Commission, nor by any particular university. It could however be created as a common project of all higher education institutions in Poland, every one who would sign an agreement. KReM (http://krem.uw.edu.pl) is the first service to be offered to all universities in Poland. The system available at http://biurokarier.edu.pl supports offices of career services of all Polish universities. It is a virtual ‘meeting place’ with the job market for students and alumni of all higher education institutions in Poland. It offers authorized data (imported from USOS) on academic career of prospective employees to prospective employers. 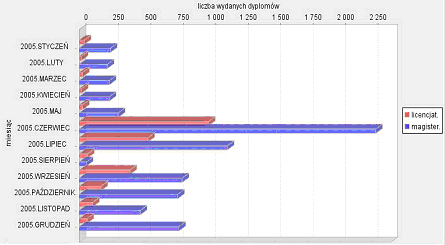 Data gathered in a database delivers a valuable statistics on professional careers of graduates and effectiveness of Polish higher education system. So called IRK-MOST, available at https://most.uka.uw.edu.pl/, is an application used by 19 universities in Poland gathered in UKA for supporting student mobility. 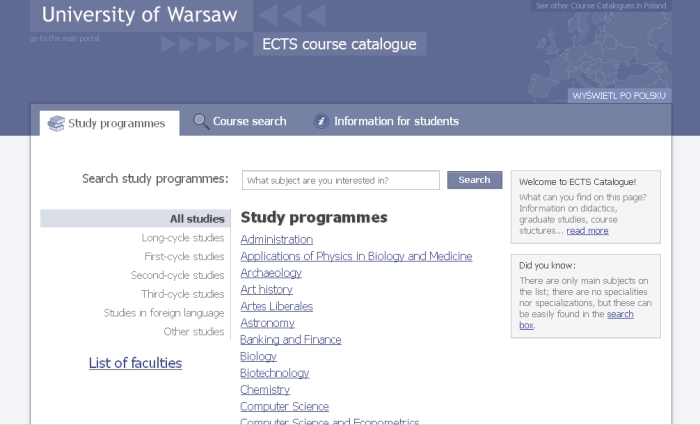 Page http://ects.edu.pl run by MUCI gathers links to ECTS guides of Polish higher education institutions. In 2008 MUCI started international cooperation within RS3G (Rome Students and Standards Group) on a network of web servers for exchange of data on mobility between higher education institutions in Europe. USOS is gradually gaining the reputation of a ‘standard’ solution for a higher education institution in Poland. Source code is open for institutions participating in the project, which helps to keep good quality and debug it faster. The system grows steadily achieving higher level of integration. Inter-university initiatives stimulate new activities, giving rise to new quality solutions. In 2007 MUCI has been awarded EUNIS ELITE AWARD of excellence for developing USOS (http://www.eunis.org/awards/eunis-elite-award/).